Here is a shot of the completed flower before I began working on the background. Here you can see the mosaic glued still with the tape on the face, drying for the grouting process. 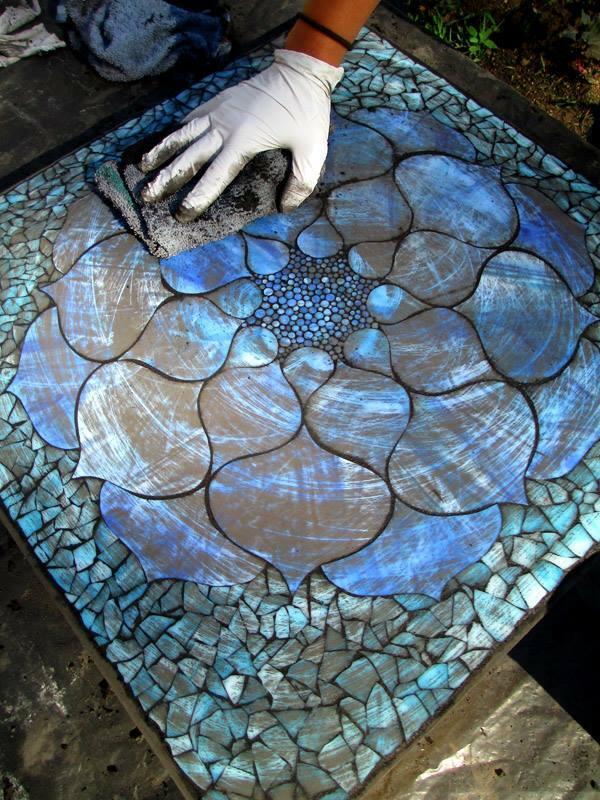 Here you can the mosaic in the grouting process - my favorite part! 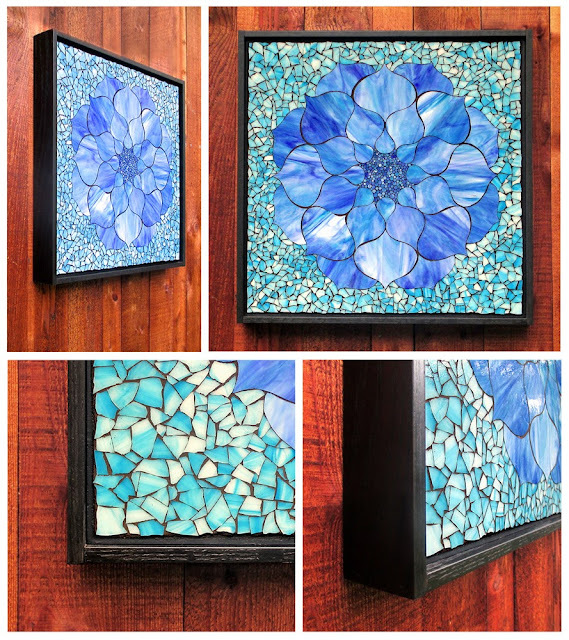 Above you can see how the mosaic is framed in a custom floating frame. The frame is 2.5" deep and .5" wide plus the .25" inner frame. It is created with red oak which is stained in ebony black and finished in satin. Your use of color is gorgeous. Are you using the direct or indirect method? Thanks! I actually use the front-mount method which is more similar to the indirect vs. the direct. I arrange all my glass on a sketch and tape it on the face as I go along. Than I glue it either all at once or in sections. Once glue is dry, I peel off the tape and grout. 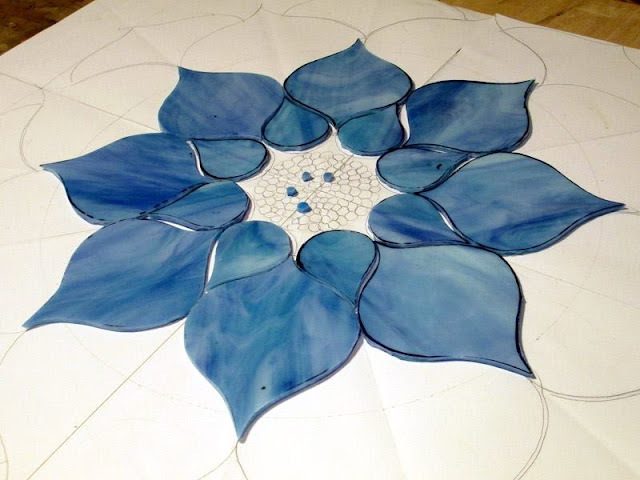 To get such perfect petals like in your Blue Lotus, do you use a pattern from your sketch to trace around, or fit them into the sketch some other way? 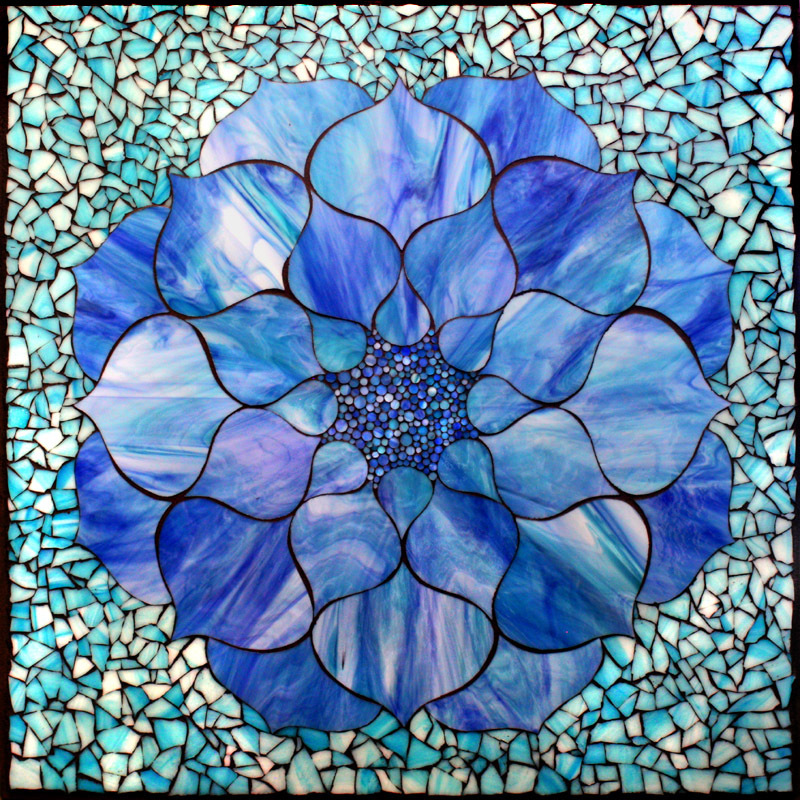 Do you have a picture of what it looks like as you tape the face of the mosaic? What kind of tape do you use? Do you give workshops, or have you written a book? Or instructions? Honestly, I appreciate all of the information you do share, and I don't know how you do it, but I am glad. Again, thank you for the beauty you add to the world. 1. 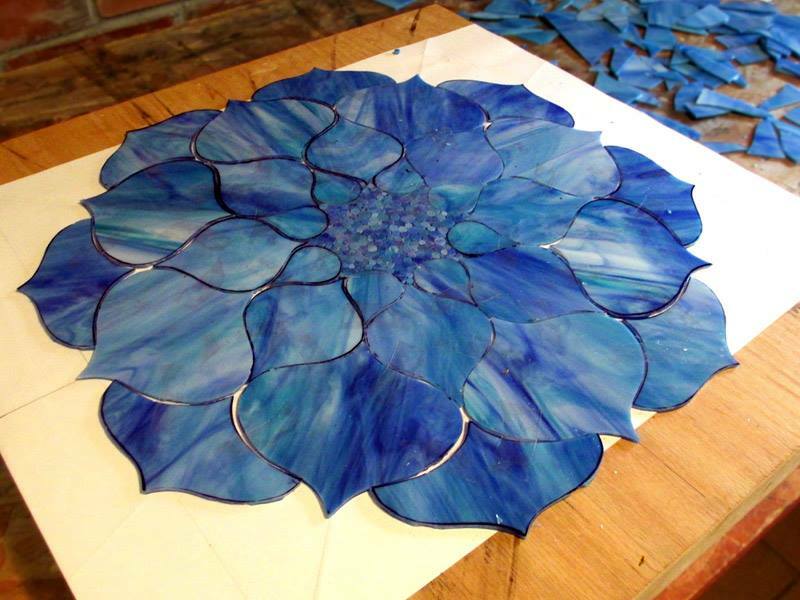 To create the Lotus petals, I choose the nicest petals from my sketch and create a template for each kind of petal in the flower. In this case there are four different sizes and shapes. I trace each petal template onto the glass and than cut it out using three tools: glass scoring tool, running pliers and tile nippers. 3. I will be starting to teach classes in the Denver area early next year and possibly workshops around Colorado and hopefully out of state eventually down the line. I've been getting a growing number of inquiries so I'm working on getting something started. 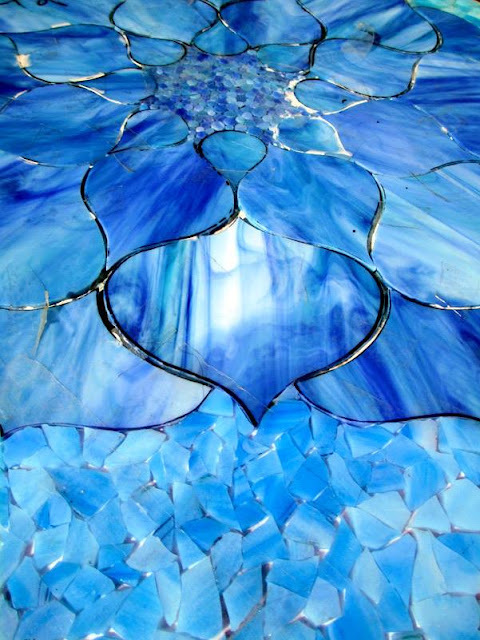 I am also designing an online class because the inquiries have been coming from lots of far away places. I'm very excited about the online class and feel that what I will come up with will be very unique and helpful to those who want to learn in the comfort of their own home and at their own time. In regards to the book, I also have been pondering that idea. I think after I design my online class and evaluate the students' learning experience, I might have a good basis to condense all the information into a book. Lots to do in 2014! I'm sorry for the late response. I don't always see a notice about a new comment on my blog in my email. Happy Holidays and Thanks for checking out my page! Looks amazing, what a beautiful result!